Carl Imhoff, leader of the electricity infrastructure at Pacific Northwest National Laboratory and chair of the Department of Energy’s Grid Modernization Laboratory Consortium, lent his expertise at two Congressional hearings in October: one with the U.S. House of Representatives and one with the Senate. On October 3, Imhoff testified before the U.S. House of Representatives Committee on Science, Space and Technology about challenges and opportunities for electric infrastructure resilience. Enhanced real-time, predictive operational tools. High-precision fast sensor networks linked to utility control centers will enable operators to predict grid system behavior, anticipate dangerous power oscillations, and optimally adjust power flows and transfer limits. Enhanced precision planning tools. Recent advances in computation and simulation tools promise to improve the accuracy and speed of system planning tools that better assess complex risk scenarios and improve system designs. Advanced grid architecture, coordination, and control. The Department of Energy is working with states and industry to envision how the new aspects of a modern grid will change and fit together in the future. This effort will then frame where changes in coordination and control of utility and consumer systems must occur. Advanced data and visual analytic tools. Trends such as e-commerce and consumer devices and services are dramatically increasing data within the power system. Substantial opportunities exist for “big data” management, advanced data analytics, machine learning, network science, and research to secure the grid and effective use of data generated by the grid. Energy storage at an affordable price point. Future power systems will greatly benefit from increased use of energy storage to serve as a “shock absorber” as loads become more complex and generation more variable. Energy storage systems will help reduce the risk of outages, enhance emergency operations, and improve system resiliency. In Washington State, PNNL and two major university campuses are establishing transactive controls of responsive distributed energy resources, major loads, and energy storage to collectively deliver resilience and flexibility to the regional grid. To reduce the severity of power outage impacts in coastal cities such as New Orleans, a strategy has been developed to effectively use local distributed generation, microgrids, and renewable energy resources as well as cost-effective grid resilience enhancements. Strategies have also been developed for enhancing resiliency of power grids supporting remote communities in states such as Kentucky and Alaska. These strategies involve advanced microgrid controls and informed investment decisions. To protect the grid from cyber and physical attacks as well as storms, an all-hazards approach is being developed based on advancements in sensors, data analytics, and a response/mitigation framework. The national labs are teaming with southeastern U.S. utilities to deploy and test advanced sensor platforms and analytic tools to enhance power system monitoring and recovery in the face of increasingly extreme events like hurricanes. Finally, DOE has awarded seven new public-private resilient distribution system projects to the national laboratories and their industry partners. The full hearing video and text of the testimony are available on the hearing website. 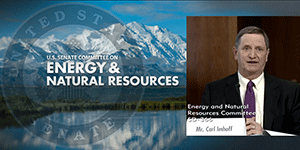 Before the U.S. Senate Committee on Energy and Natural Resources on October 26, Imhoff testified on the subject of advanced technologies to protect the power grid and other energy infrastructure from cyber attacks. Development and deployment of synchrophasor technology that detects impending system control and equipment faults for operators, helping to avoid major blackouts. California stakeholders estimate $360 million in annual customer savings due to avoided outages, plus $90 million in annual savings in improved use of existing generation and delivery systems. This new technology is providing the basis for a new tool to better analyze complex blackout scenarios that will lead to improved resilient grid upgrades which resist cyber threats. The Pacific Northwest Smart Grid Demonstration Project — the largest of its kind — validated smart grid benefits and new control approaches that engage demand and distributed resources at scale. As a result, Avista Corporation implemented distribution automation and smart metering pilots that delivered a 10-percent reduction in customer outages, reduced consumer outage durations by 21 percent, and resulted in 1.5 million avoided outage minutes between April 2015 and April 2016. The national GridEx was designed to link industry with government and law enforcement agencies to conduct cyber-attack exercises. Held in November 2015, GridEx III engaged 364 organizations and more than 4,000 participants in cyber-attack scenarios. Cyber Situational Awareness. The Cyber Risk Information Sharing Program—or CRISP—is a voluntary situational awareness program that identifies cyber threats to utilities and shares that information with other utilities, which collectively generate over 75 percent of the nation’s electricity. Cyber situational awareness is now being extended to increase attention on the grid control systems internal to the utilities, as well as interdependent infrastructures such as fuel delivery and communications. Advanced Science and Technology Research. Advanced science and technology cyber resilience concepts are being applied grid security in pursuit of new power system paradigms that are inherently resilient and adaptive. These include adaptive networks include “software defined networks” that provide an additional defense layer to communications networks; data resilience tools like Blockchain, a new approach to protecting data in open environments; and adaptive control systems, which adjust in real time based on system conditions at the moment. Imhoff also indicated that grid operators must learn and implement basic "cyber hygiene" measures—practices and policies that can be undertaken regularly to keep systems healthy. DOE is working with industry to help small and mid-sized utilities—which aren’t required to meet cyber defense requirements—to improve their cybersecurity readiness.